What is a Wide Local Excision? 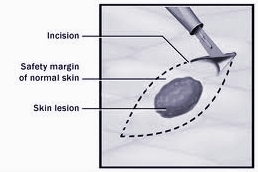 A wide local excision is a surgical procedure that removes the atypical lesion with a small margin of normal, healthy tissue around it (see diagram below.) Since these excisions require removal of healthy skin surrounding the original biopsy site, it results in a larger wound. Once the tissue is removed, the edges of the site are sutured together. The tissue is then sent to a Pathologist, who specializes in analyzing skin tissue, who will review the tissue for clearance. What lesions are Wide Local Excisions used for? Wide local excisions are performed for atypical nevi (moderate-severe and severely atypical nevi) that are still confined to skin and have not spread to deeper levels of tissue. What can I expect the day of the excision? On the day of your excision, you will be brought into the exam room where the Dermatologist performing the excision will review the original pathology results and then discuss the wide local excision procedure with you. At this time, you should feel free to ask any questions that you may have about the pathology results and/or the upcoming procedure. The Dermatologist will outline the area they will be excising and then begin injecting localized freezing into the area. You will be left in the room for 15-20 minutes while the freezing is taking effect. While this freezing is “quick acting” this is done to ensure that you experience no discomfort and assists with bleeding during the procedure. What can I expect after the procedure is over? For more medical services click here.